Review by AllTheBestFights.com: 2017-07-01, good exchanges between Eduard Troyanovsky and Michele Di Rocco: it gets three stars. The former Ibf light-Ww champion Eduard Troyanovsky entered this fight with a professional boxing record of 25-1-0 (22 KOs=88%) and he is ranked as the No.7 super lightweight in the world (currently the #1 in this division is Terence Crawford). He fought three times last year beating Cesar Rene Cuenca (=Troyanovsky vs Cuenca 2) and Keita Obara (=Troyanovsky vs Obara) but then he suffered his first loss against Julius Indongo (=Troyanovsky vs Indongo). His opponent, Michele Di Rocco, has an official record of 41-2-1 (18 knockouts) and he entered as the No.30 in the same weight class. He lost to Ricky Burns in 2016 (=Burns vs Di Rocco) but he came back to win in 2017 against Mikheil Avakian. 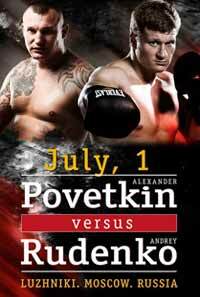 Eduard Troyanovsky vs Michele Di Rocco is on the undercard of Alexander Povetkin vs Andriy Rudenko. Watch the video and rate this fight!